Exocytosis and endocytosis are fundamental biological processes for all eukaryotes. They occur across a wide array of species, organs and cell types, yet utilize common principles and closely related molecular machinery. Exocytosis is the vesicular delivery of cargo to the cell surface (for membrane proteins) or to the extracellular medium (for soluble compounds). Endocytosis is the reverse process. Two general classes of exocytosis exist: constitutive and calcium‐triggered. The former occurs in all eukaryotic cells for cell membrane maintenance and release of compounds such as cell matrix components. The latter occurs in cells specialized in secreting cargo on demand, for example secretion of digestive enzymes into the pancreatic duct (and ultimately into the duodenum) after a meal, insulin secretion into the bloodstream by pancreatic β‐cells following a rise in blood glucose or catecholamine secretion by adrenal chromaffin cells under stress response, to name a few. A highly specialized and tightly controlled version of exocytosis controls synaptic vesicle release in neuronal presynaptic terminals and underlies neuronal communication. Endocytosis comes in several varieties 1, but all involve generation of a plasma membrane bud into the cytosol that is pinched‐off. Endocytosis is essential for fighting infection (phagocytosis), uptake of nutrients, signalling and cell membrane homeostasis. It is also hijacked by pathogens, such as the influenza virus, to enter cells. Exocytosis and endocytosis are the yin and yang of cell surface membrane trafficking; yet, small, intimate meetings that bring together both topics are rare, perhaps because both fields have become large and specialized. In addition, neuroscientists, biochemists, biophysicists and cell biologists have been approaching the same questions from different angles, but do not always communicate directly with one another. To bridge these gaps, an EMBO Workshop on Exocytosis and Endocytosis was organized 16–20 January 2018, on the Canary Island of Tenerife, Spain (http://meetings.embo.org/event/18-exo-endocytosis). It covered a sampling of the broad exo–endocytosis‐related research and diverse approaches used. During calcium‐triggered exocytosis, after a vesicle is delivered to a release site, it must undergo a number of ‘priming’ steps to become release ready that is poised to fuse upon an increase in local calcium concentration 2. A major unresolved question in the field is the biochemical and structural correlates of priming. The primed structure must prevent fusion under resting, low calcium concentration, but allow rapid fusion (well under 1 ms in the case of neurotransmitter release 3) when calcium rushes to the release site. The meeting started with a lecture by one of us (JER) on a proposed model of the primed state of the fusion machinery for rapid synaptic vesicle fusion, based on a synthesis of work from the Rothman and other laboratories. This is a speculative working model, and as any useful model provides a testable framework and has generated many discussions. The model is described in a recent FEBS Letters article 4. Synaptotagmin‐1 is the major calcium sensor for neurotransmitter and hormone release 5, but how it functions together with the SNARE proteins that drive fusion 6 and complexin that synchronizes exocytosis 7 is hotly debated. In the Rothman buttressed ring model 4, synaptotagmin‐1 oligomerizes into a ring with other components of the fusion machinery that rapidly dissociates upon calcium binding. In this Special Issue, Park and Ryu 8 discuss the ring model, as well as other models of synaptotagmin‐1 function. Garcia‐Martinez et al. 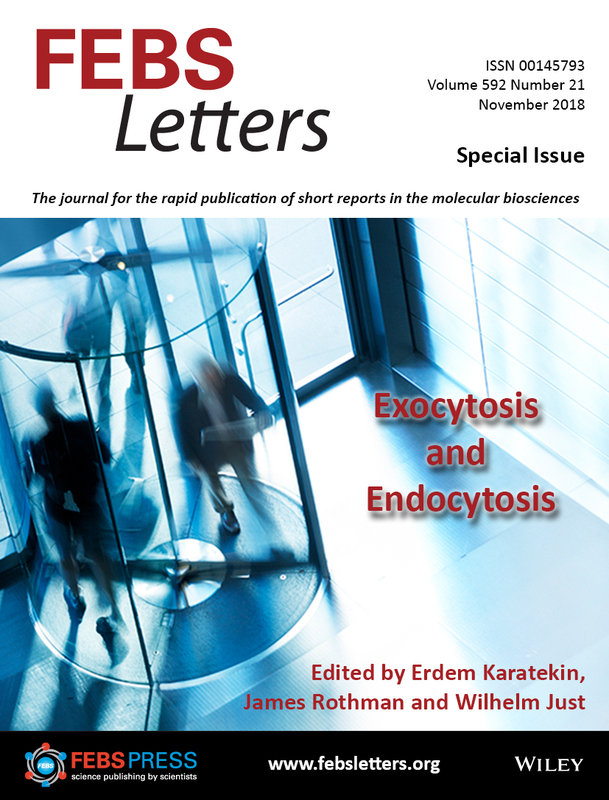 9 review lipids that modulate exocytosis through various mechanisms, including recruitment of fusion proteins to specific sites, modulation of local membrane properties or lipidation of key fusion proteins. In an original research article using coarse‐grained molecular dynamics simulations, McDargh et al.10 show that any number of SNAREpins bridging a vesicle to the plasma membrane can fuse membranes, but fusion is faster with more SNAREs. Bohme, Grasskamp, and Walter 11 discuss recent studies of synaptic vesicle release probability and short‐term synaptic plasticity regulation by release site Ca2+‐channel coupling mediated by unc‐13 and active zone proteins. The initial structure that forms upon fusion is a narrow connection between the apposed vesicular and plasma membranes called the fusion pore. It is a key intermediate, as it can remain small, fluctuate in size, close‐open (flicker) multiple times, and reseal or expand rapidly. These dynamics affect the kinetics and amount of cargo released, and the kinetics and mode of endocytosis. Patrik Rorsman highlighted the importance of the fusion pore in type 2 diabetes, where reduced glucose‐stimulated insulin release has recently been linked to fusion pores that remain small, preventing escape of insulin through the fusion pore 12. Reflecting its central role in connecting exo‐ and endocytosis (and the bias of one of the organizers) the fusion pore is the subject of three reviews in this issue. Alvarez de Toledo et al. 13 provide a historical perspective and focus on the role of the intragranular matrix in controlling cargo packaging and release kinetics. Manfred Lindau 14 provides a thorough and critical review of molecular manipulations affecting fusion pores during exocytosis and possible mechanisms. The review by one of us 15 (EK) emphasizes how fusion pores detected during exocytosis by different methods are sensitive to different stages of pore development. This background is then used to compare the results of recent nanodisc‐based single‐pore fusion assays 16-18 with exocytotic fusion pore properties. Ling‐Gang Wu presented recent super‐resolution imaging of fusion pores in live neuroendocrine cells that close even after reaching large sizes 19 (comparable to vesicle size). Resealing of fusion pores quantitatively accounted for endocytosis measured by capacitance 20. In contrast, yeast endocytosis starts with a flat membrane that needs to be bent against turgor pressure and membrane tension. Correlated fluorescence microscopy and electron microscopy tomography analysis of yeast endocytic structures with stunning detail 21 was presented by Wanda Kukulski. Molecular mechanisms of force production in clathrin‐mediated endocytosis are reviewed in this issue by Lacy et al. 22. Exocytosis and endocytosis are coupled to maintain cell surface area and identity of different morphological and functional domains, but coupling mechanisms are poorly understood. An example occurring on the short term is the local recycling of synaptic vesicles 23. In this Special Issue, Chanaday and Kavalali discuss the temperature dependence of synaptic vesicle recycling 24. On the long term, internalized membrane components are sorted through the endosomal system and sent to various destinations. An extreme example of endosomal trafficking occurs in neurons where neurotrophins that bind to their receptors at distal axons are endocytosed and trafficked to the cell body where their signals are integrated. The signalling endosome is reviewed by Villaroel‐Campos et al. 25. Most neuronal synapses utilize a highly conserved fusion machinery including SNAREs, complexins and synaptotagmins 26. However, hair cells of the inner ear have an atypical fusion machinery that does not appear to rely on many of these components. Instead, a large protein called otoferlin is required for exocytosis, calcium‐sensing and vesicle turnover, but how it achieves these various functions is poorly understood. Pangrsic and Vogl 27 review the hair cell synaptic vesicle cycle. The meeting also included many other interesting presentations on specialized exo–endocytic systems, endocytosis and membrane fission mechanisms in neurons and reconstituted systems, mechanisms of constitutive exo–endocytosis and emerging tools to study exo–endocytosis. The meeting ended with a talk by Reinhard Jahn who summarized some of the most pressing questions in exocytosis. During and after the meeting, one of the comments we heard repeatedly was how much the participants had learned from one another, due to the diverse topics covered, and that the meeting should be repeated in a similar format. We could not agree more. Pollard TD, Earnshaw WC, Lippincott‐Schwartz J, Johnson G (2017) Cell Biology, 3rd edn. Elsevier, New York. Sudhof TC (2013) Neurotransmitter release: the last millisecond in the life of a synaptic vesicle. Neuron 80, 675–690. Kaeser PS and Regehr WG (2014) Molecular mechanisms for synchronous, asynchronous, and spontaneous neurotransmitter release. Annu Rev Physiol 76, 333–363. Rothman JE, Krishnakumar SS, Grushin K and Pincet F (2017) Hypothesis ‐ buttressed rings assemble, clamp, and release SNAREpins for synaptic transmission. FEBS Lett 591, 3459–3480. Geppert M, Goda Y, Hammer RE, Li C, Rosahl TW, Stevens CF and Südhof TC (1994) Synaptotagmin I: a major Ca2+ sensor for transmitter release at a central synapse. Cell 79, 717–727. Weber T, Zemelman BV, McNew JA, Westermann B, Gmachl M, Parlati F, Söllner TH and Rothman JE (1998) SNAREpins: minimal machinery for membrane fusion. Cell 92, 759–772. Dhara M, Yarzagaray A, Schwarz Y, Dutta S, Grabner C, Moghadam PK, Bost A, Schirra C, Rettig J, Reim K et al. (2014) Complexin synchronizes primed vesicle exocytosis and regulates fusion pore dynamics. J Cell Biol 204, 1123–1140. Park Y and Ryu JK (2018) Models of Synaptotagmin‐1 to trigger Ca2+‐dependent vesicle fusion. FEBS Lett 592, 3480–3492. Garcia‐Martinez V, Gimenez‐Molina Y, Villanueva J, Darios FD, Davletov B and Gutierrez LM (2018) Emerging evidence for the modulation of exocytosis by signaling lipids. FEBS Lett 592, 3493–3503. McDargh ZA, Polley A and O'Shaughnessy B (2018) SNARE‐mediated membrane fusion is a two‐stage process driven by entropic forces. FEBS Lett 592, 3504–3515. Bohme MA, Grasskamp AT and Walter AM (2018) Regulation of synaptic release‐site Ca2+ channel coupling as a mechanism to control release probability and short term plasticity. FEBS Lett 592, 3516–3531. Collins SC, Do HW, Hastoy B, Hugill A, Adam J, Chibalina MV, Galvanovskis J, Godazgar M, Lee S, Goldsworthy M et al. (2016) Increased expression of the diabetes gene SOX4 reduces insulin secretion by impaired fusion pore expansion. Diabetes 65, 1952–1961. Alvarez de Toledo G, Borges R, Montes MA and Montenegro P (2018) Phases of the exocytotic fusion pore. FEBS Lett 592, 3532–3541. Sharma S and Lindau M (2018) . FEBS Lett >span class="vol">592, 3542–3562. Karatekin E (2018) Toward a unified picture of the exocytotic fusion pore. FEBS Lett 592, 3563–3585. Wu Z, Auclair SM, Bello O, Vennekate W, Dudzinski NR, Krishnakumar SS and Karatekin E (2016) Nanodisc‐cell fusion: control of fusion pore nucleation and lifetimes by SNARE protein transmembrane domains. Sci Rep 6, 27287. Wu Z, Bello OD, Thiyagarajan S, Auclair SM, Vennekate W, Krishnakumar SS, O'Shaughnessy B and Karatekin E. Dilation of fusion pores by crowding of SNARE proteins. eLife 2017;6:e22964. Bao H, Das D, Courtney NA, Jiang Y, Briguglio JS, Lou X, Roston D, Cui Q, Chanda B and Chapman ER (2018) Dynamics and number of trans‐SNARE complexes determine nascent fusion pore properties. Nature 554, 260–263. Shin W, Ge L, Arpino G, Villarreal SA, Hamid E, Liu H, Zhao WD, Wen PJ, Chiang HC and Wu LG (2018). Visualization of membrane pore in live cells reveals a dynamic‐pore theory governing fusion and endocytosis. Cell 173, 934–945.e912. Chiang HC, Shin W, Zhao WD, Hamid E, Sheng J, Baydyuk M, Wen PJ, Jin A, Momboisse F and Wu LG (2014) Post‐fusion structural changes and their roles in exocytosis and endocytosis of dense‐core vesicles. Nat Commun 5, 3356. Kukulski W, Schorb M, Kaksonen M and Briggs JA (2012) Plasma membrane reshaping during endocytosis is revealed by time‐resolved electron tomography. Cell 150, 508–520. Lacy MM, Ma R, Ravindra NG and Berro J (2018) Molecular mechanisms of force production in clathrin‐mediated endocytosis. FEBS Lett 592, 3586–3605. Lou X (2018) Sensing exocytosis and triggering endocytosis at synapses: synaptic vesicle exocytosis‐endocytosis coupling. Front Cell Neurosci 12, 66. Chanaday NL and Kavalali ET (2018) Time course and temperature dependence of synaptic vesicle endocytosis. FEBS Lett 592, 3606–3614. Villaroel‐Campos D, Schiavo G and Lazo OM (2018) . FEBS Lett >span class="vol">592, 3615–3632. Sudhof TC and Rothman JE (2009) Membrane fusion: grappling with SNARE and SM proteins. Science 323, 474–477. Pangrsic T and Vogl C (2018) Balancing presynaptic release and endocytic membrane retrieval at hair cell ribbon synapses. FEBS Lett 592, 3633–3650.